The Stokke Gravity Chair | OhGizmo! The Stokke Gravity Chair is exactly the sort of innovative design that we like to feature on this site. Sure, we don’t always find stuff like this, but we gotta get you junkies fixed day in, day out, so we do what we can. 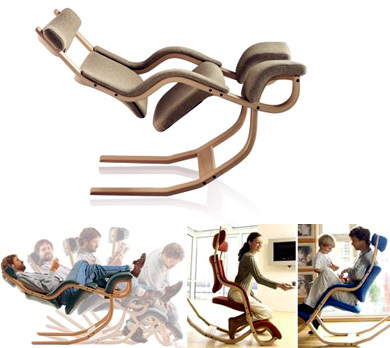 This chair features an unusually long set of legs, which allows you to do all sorts of funky things with it. The legs are bent in such as way as to feature three flat planes, so you can recline, incline or lay flat, simply by shifting your body weight. The integrated footrest also doubles as a kneeler so you can be comfortable in the forward position. We think it’s brilliant, but rather expensive, at $2,300. Of course, you might want to look at it as getting three chairs for the price of one… but it’s still a lot of cash. We can’t actually find the product on their site, and the link chain leads pretty much nowhere, so we don’t know if it is actually available or not. If anyone has a few hours to kill and decides to hunt around, let us know. You can purchase this chair in the UK from a company called Back in Action – who also sell other amazing chairs. Alternatively, I will be putting my black Gravity chair on eBay shortly, as I can’t find space for it in my house any more (UK sale). It’s incredible to lie back in – it’s so well balanced it rocks gently to your heartbeat – really! Ben Holmes- where do you and your chair live? The Stokke Gravity Chair is part of the Varier products. I found it on http://www.varierfurniture.com, along with other cool chairs. I’d love to have one, but it’s sooo expensive!